It is very unlikely that the Viking explorers used any flags, but that doesn't stop flag manufacturers from providing them. The Vikings left few writing records of their explorations except those found in the famous Norse Sagas and no flags were mentioned. However, the Raven "Banner" was the most the most commonly reported Norse "flag" and it is possible that they might have brought it with them on their journeys to North America. We do know that Viking explorers like Bjarni Herjulfesson, Helge Ingstad, Eric the Red, and Leif Ericsson all played a part in the early exploration of North America between AD 800-1000, but again there is no historical documentation to support the assumption that Raven Banner or any other flag was used. Currently, all iconographic evidence strongly suggests the Guðfani (raven) banner was not a banner, but a semi-circular metal vexilla ornamented with streamers. It was actually a metal wind vane used on ships to gauge the direction and strength of the wind. The "tails" were narrow ribbons attached to it to give early indication of wind changes. This was the expeditionary flag for Admiral Christopher Columbus's historic voyage of discovery in 1492. This was not his personal flag as is sometimes suggested. The letter "F" was for King Ferdinand (Fernando) and the "Y" is for Queen Isabella (Ysabel). Strangely enough the usual English translation for Queen Ysabel is Isabella, which is neither proper English nor Spanish. The English translation for her name would be "Elizabeth." This ensign was flown by all three of the captains of his famous ships, the Pinta, the Nina, and the Santa Maria. Is this the Royal Standard used by Columbus in 1492? According to Christopher Columbus' logbook, he took the "Royal Flag," and two of his "Captain's Flags" when he landed on San Salvador (Watling's Island) in the Bahamas on October 12, 1492, to claim the newly discovered lands for his sponsors Isabella I of Castile and Ferdinand II of Aragon. These three flags became the first European flags to fly over the Americas if you discount the possibility of a Viking banner. The tradition claims the Royal Flag was quartered in red and white squares representing a Spain newly united under the "lions" of the royal house of Aragon and the "castles" of Castile. But which Royal flag remains a question? The Cross of Burgundy Flag was used by Spain as a naval ensign, and up to 1843 as a war flag on land. The banner dates back to the early 15th century when the Duke of Burgundy, as a claimant to the French throne, backed up the English in the Hundred Years War. When King Charles I ascended the throne, he adopted this flag in honor of his father Philip, the Duke of Burgundy. This is the flag carried by the conquistadors in their conquest of the Americas. The Dutch tricolour was first used in the second half of the 16th century when the Dutch provinces revolted against Spain. Their leader was Prince William of Orange. The flag was named the "Prinsenvlag" ("Princeflag") after him. It was used as the naval ensign for Dutch ships and was the nearest thing to a national flag that the Dutch had when exploring North America. It was not uncommon to have versions of this Dutch tricolored flag (either orange-white-blue or later red-white-blue) with twice the stripes (double Princeflag - 6 stripes) or even three times the stripes (triple Princeflag - 9 stripes) on Dutch ships. Sometimes extra white stripes were added making 7 and 11 stripes on some versions. In 1572 the orange-white-blue flag was first mentioned when the town of Den Briel was liberated. The red-white-blue flag was first mentioned in 1596. After 1660 the version with the orange stripe became very rare. It's still unknown why the orange stripe was changed, but one theory suggest simply that a new method of producing orange paint resulted in a darker shade, almost red. The colors on the tricolor were never made official until 1937 when Queen Wilhelmina declared that "the colours of the flag of the Kingdom of the Netherlands are red, white and blue." In 1958, the colors were defined more precisely as bright vermilion and cobalt blue. Most likely caused when the original center stripe was inadvertently sewn on upside down. The Dutch foothold of New Amsterdam in North America, originally founded in 1625 by Minuit, would be lost to the English in 1664 during the Second Anglo-Dutch War, retaken from the English during the third Anglo-Dutch War, but then ceded back to the English as part of the Treaty of Westminster (1674) at the war's end. New Amsterdam was eventually renamed New York by the English to honor the Duke of York (later King James II). After this time, although no longer playing a key part in North American colonization, the Dutch East Indies Company continued to control Dutch colonies in Asia until 1800. Hudson's last voyage of discovery was financed by a British company. The Honorable East India Company (see flag below) wanted to find the "North West Passage" over the top of North America to the Indies. On the voyage Henry Hudson, was cast ashore to die by his mutinous crew in the bay which now bears his name. When the Dutch East India Company (VOC) was founded in 1602, some traders in Amsterdam were unhappy with being left out of the trade monopoly. These Dutch merchants were allowed to organize a competing organization called the Chartered West India Company (Geoctroyeerde Westindische Compagnie) in 1621. They were granted a new trade monopoly in the West Indies and given jurisdiction over the Atlantic slave trade, Brazil, the Caribbean, and North America. The WIC was organized similarly to the Dutch East India Company: it had five offices, or chambers (kamers), in Amsterdam, Rotterdam, Hoorn, Middelburg and Groningen; of which the chambers in Amsterdam and Middelburg were the largest. But unlike the VOC, WIC had no right to deploy military troops, so they turned to privateering. The arming of merchant ships with guns and soldiers (normally 40-50) to "defend" themselves, soon led to the hijacking of enemy ships. In 1628, a Dutch "merchant" ship, under the command of Captain Piet Heyn, seized a Spanish galleon which was on its way to Spain carrying all the silver mined in the Spanish colonies for the entire year. The company was initially relatively successful and established trading posts and colonies both in Africa and the Americas. In the Americas, fur (North America) and sugar (South America) were the most important trade goods, while African settlements provided slaves destined for plantations, gold and ivory. In 1630, the colony of New Holland was founded, taking control over Portuguese possessions in Brazil. Unfortunately for the WIC the Anglo-Dutch Wars and English victories, soon doomed the company. The original WIC went bankrupt in 1674, and a Second Chartered West India Company, or the New West India Company (chartered 1675), proved incapable of defending its colonies. In 1791, the second company's stock was bought by the Dutch government and all territories held by both companies reverted to the rule of the States General of the Dutch Republic. In 1638, after a 4-month voyage from Sweden, two Swiss ships sailing for the Swedish West India Company, under the command of Peter Minuit, who later became the first Governor, sailed into Delaware Bay to start what became the Colony of New Sweden next to the southern Delaware River, actually in territory already claimed by the Dutch. They built a fort named Fort Christina, after Queen Christina of Sweden, at the site of the present day city of Wilmington and left 24 men, under the command of Lieutenant Måns Kling, to man the fort and trade with Indians. The expedition, sponsored by the Swedish West India Company, was the first of 11 expeditions (14 voyages) to the Delaware area between 1638 and 1655. The Swedish Naval ensign flew over the Colony of New Sweden during this time. Since the flags used in the colony were obtained from the ships that brought the almost 600 settlers of the colony during the next 15 years, the naval ensign was a natural choice. This two-tailed flag would fly over the colony until its loss to the Dutch in 1655, when naturally the Dutch flag was raised to replace it. Some illustrations of the New Sweden Colony incorrectly show the more modern three-tailed Swedish flag (with the horizontal yellow bar extended and made into a tail) as the flag used by the colony, but this is incorrect. 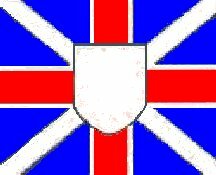 The British flag would then replace the Dutch flag in 1664 when the English captured the New Sweden Colony from the Dutch. This flag was in use in England since the Crusades and it was one of the national emblems of England as early as 1277. Sir Walter Raleigh and Sir Francis Drake flew this flag while exploring the New World. It has been the English national flag for almost 900 years, and is still considered the legal national flag today. Although the flag may have been used on ships that anchored near Jamestown, there is no evidence that this flag, or any other flag, was used on shore in Jamestown. The first reference to flags flying in Virginia were dated much later, long after the abandonment of Jamestown. Both flags are displayed today at the reconstructed fort at Jamestown. Using mercenaries to control conquered lands by private companies is not a new practice, and government hiring corporations to control colonies isn't new either. Parliament used the British East India Company to conquer and manage India, and later gave the company trade monopolies in parts of the New World to help pay them. The East India Company was expected to provide the necessary "soldiers for hire" to rule India, and profits made from exporting their Indian tea to the American Colonies helped pay for those soldiers. The red and white stripes originated in a pattern popular in the Tudor period (1485-1603), and most invariably had the Saint George Cross in the canton. Since the British East India Company didn't seem to actually have any real clear expectations on their flag design, other than using horizontal red and white stripes, we have flags with nine, ten, eleven or even thirteen stripes; with various cantons of varying size, some sitting on stripes and some cutting through the stripes. Also shown in a painting titled "Two Views of an East Indiaman of the Time of King William III" by Isaac Sailmaker (1633-1721), were long narrow flags with five red and white stripes flown from the foremast and mizzen-mast of EEIC ships, which look like an attempt to make a flag halfway between an ordinary flag and a masthead pennant or streamer. One flag expert said, "They seemed to make them up as they went along." This isn't surprising because the flags were usually made by the crews of the ships and they were not terribly fussy about details. Interestingly enough, although the British East Indies Company didn't trade directly with the North American colonies and their ships were not permitted to fly this ensign north of Saint Helena, there is a 1754 engraving by Thomas Penn showing what appear to be ships off Philadelphia flying the striped flag of 1707. However, noted Flag historian Peter Ansoff discovered that the ships in the engraving were in fact copied from an earlier engraving showing ships at anchor in Bombay harbor. For more information about the EEIC and more of their flags see the English East India Company on the "Flags of Britain and the United Kingdom" page. There is no evidence to indicate how much this flag was actually used to represent Maryland in Colonial times, or in the years leading up to the Revolutionary War. However, its design is used today as a part of the State flag of Maryland. A white Pine Tree ensign, accompanied by the motto "Appeal to Heaven" became that of the Massachusetts Merchant Navy in 1775, and a year later became the official flag of the short lived Massachusetts Navy which was destroyed by the British at the Battle of Penobscot Bay. The tradition continues today and since 1971, the plain white flag with just the Pine tree has been the official Massachusetts Naval Flag. Red Flag of New England? This flag first appeared in 1686 in a drawing done by a young British officer named John Graydon who painted the picture of the New England Flag in a manuscript, now in the collection of Magdalene College in Cambridge, England. Graydon (born c1663, died c1726) later became an Admiral in His Majesty's Royal Navy and was quite well known in his day. His drawing showed a white flag (not shown) with a red cross and a green tree in the canton. We know a version of this flag with a red field (shown) had some use by Colonial merchant ships sailing out of New England ports as early as 1693, and it was the earliest flag identified with all of New England, although it was flown by mainly by ships from the Massachusetts Bay Colony. This flag later became a frequent navy flag for many New England ships. The New England Ensign appears on flag charts printed in 1693, 1701, and 1705. However, the New England Flag was also shown on a Dutch flag chart in 1711 as having a globe instead of the tree in the canton. A French flag chart was published in 1693 and reprinted in 1703 shows the Pine Tree, but shows heraldic hatching for a blue field, although describing it as being the "Red Ensign of New England" . The 1711 and 1718 publications also show the heraldic hatching for blue and were likely copied from the 1693 sheet. No English or American source shows a blue field. The appearance on flag charts implies that the New England Ensign was in use as a maritime flag, but according to the Proclamation of 1674, the only legal flag to fly on a colonial ship was the red ensign with the St. George Cross canton. Adding the tree may have happened quite unofficially, but we have no real evidence of this. Sir Edmund Andros was probably the most hated man in America in 1687 by the residents of Massachusetts Bay and the other colonies that had been attached to the new Dominion (New Hampshire, Connecticut, Rhode Island, New Haven, New York). They had always governed themselves and this new governor and his administration was forced upon them unwillingly. The "New England" flag was probably intended for the colours of the military guard that accompanied Andros. Apparently two copies of the flag were made for Sir Edmund Andros when he sailed to Boston in 1687 to take control of the new Dominion of New England. They were described as having a pole and fringe (not shown here), so the supposition is that these were used as his body guard's ceremonial colours. The Glorious Revolution of 1688 ended both the Dominion and the rule of Governor Andros a short year later. In 1701 another variant of the Union Jack was created for the use of ships commissioned by the governors of the North American colonies. It is unknown how much use this variant saw before the introduction of the Colonial Red Ensign by Queen Anne six years later. The Bedford Flag may be the oldest complete flag known to exist in the United States. Physical and historical evidence dates it from early in the 1700s, and the Bedford Flag is similar to a flag described as having been used by a cavalry troop of the Massachusetts Bay Militia in the French and Indian Wars. It may well have been that flag. Further legend states that it was later carried by Bedford Minuteman, Nathaniel Page, to the Concord Bridge on April 19, 1775, at the beginning of the American Revolution. However, there is no proof, either from testimonies, depositions, diaries or memoirs written by any participants, mentioning any such flag flown that day. The Latin inscription "Vince Aut Morire" means "conquer or die." The arm emerging from the clouds represents the arm of God. The original is housed at the Bedford, Massachusetts Town Library. The British Red Ensign, also known as the "Meteor" Flag, was adopted as the new flag for England and her colonies in 1707 at the request of Queen Anne. Because of this the flag also carries the name "Queen Anne's Flag." This was the first "national flag" to fly over the English American colonies. After Roger Williams stated the cross was a symbol of the antichrist, John Endicott, a former Governor of Massachusetts Bay Colony, led an attempt to have part of the cross removed from the militia colours of the troops at Salem. The Great and General Court of the Massachusetts Bay Colony found Endicott had "exceeded the lymits of his calling" and punished him by forbidding him to hold public office for one year. The militia leaders then decided leave out the cross completely in their colours after that incident, at least in Boston and the surrounding communities. There is evidence it was kept in other places in New England. Certainly it was a part of the design of the militia colours in Saybrook, Connecticut and in Newburyport, Massachusetts in this era. 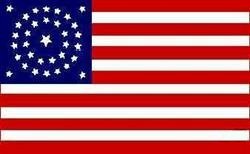 The Maryland Militia fought under the Calvert Arms in their expedition of 1754 and this may have been the first first British-American flag to go into battle with George Washington. It was certainly used in King Philip's War of 1675 and in the later French and Indian War. From 1590-1790 these four flags were used on French warships and fortresses. They were all based on the blue Royal Banner of France used since the 17th century. The blue fleur de Lys flag was gradually replaced by the white fleur de Lys flag until the French Revolution. It is believed that the white Fleur de Lys flag of France flew over all or most of the French forts and settlements in America. The multiple fleur de Lys pattern was purchased in large lots and then cut to whatever size was need for a particular flag. Therefore, the number of fleur de Lys on each flag would depended on it's size, and no two had exactly the same number. This flag also came with a blue field background. Between 1638 and 1790; and from 1814 to 1830, a plain white flag was flown most commonly on French Royal Warships. Obviously, this probably led to some confusion since the international request to "surrender" or "parley" is also a plain white flag. There wasn't an official Russian National Flag before 1896, but the Personal Standard of the Tsar, or Imperial Flag, a double-headed golden eagle carrying Saint Vladimir's red coat of arms, on a yellow rectangular field, served the purpose. Russian Navy ships used this standard and an ensign called "The Flag of Russia" to identify their ships. While the American Revolution was taking place on the east coast of North America, peaceful Russian explorers and ships were exploring Alaska and the western coast of North America and establishing trading post. The Russian-American Company was a trading company chartered by Csar Paul I in 1799. The charter granted the company a monopoly over trade in Russian America. Under the charter, one-third of all profits were to go to the emperor. The Russian-American Company pursued the fur trade in California and in 1812 built a small fort near the Russian River called Ft Ross. Ivan Alexandrovich Kuskov was the founder of Fort Ross and from 1812 to 1821 its colonial administrator. Fort Ross was the southernmost Russian outpost and is now reconstructed as a California State Historical Park. On September 10, 1812, when Ivan Kuskov established Fort Ross and claimed the Northern "Kalifornii" coast for the Czar, he unfurled this flag of Russia, the light blue Cross of St. Andrew on a field of white. Later Captain John A. Sutter bought Fort Ross on December 12, 1841, for $30,000, mostly in foodstuffs and some gold, and the fort eventually passed into American hands.